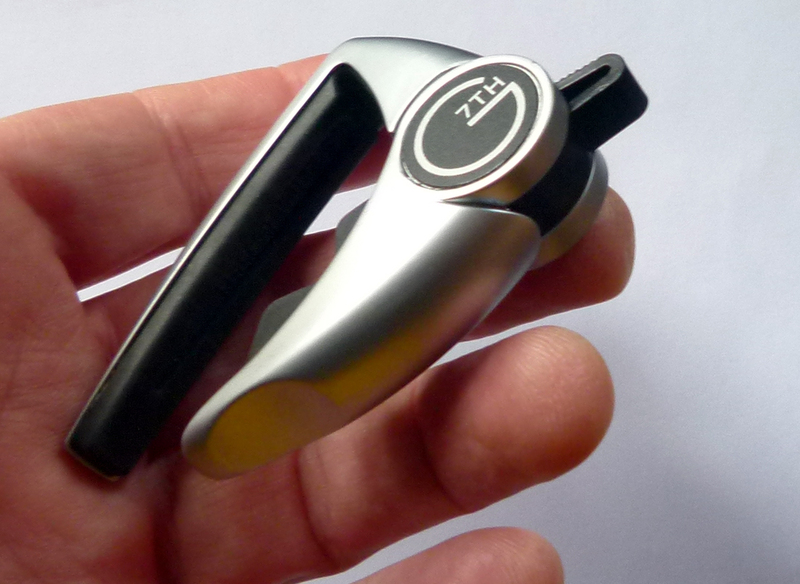 I wrote a review of the G7th Performance Capo some years ago, and here is a revised version. Withstanding the test of time, my opinion of this capo grew in a positive direction. Pros: Handsome design, the G7th Performance capo is easy to adjust to any pressure, stays locked in place, and removes most intonation issues suffered by other capos. Cons: Does not work as effortlessly with every neck shape. Vintage-style V necks require a little practice to get a buzz-free performance. It is a little larger than other capos, so it doesn’t travel unnoticed in a front jeans pocket. Bottom Line: An easy on – easy off capo, with a small learning curve, the G7th Performance capo won’t pop off unexpectedly. It is sturdy, looks modern and does what it was made for. Unlike many capos, the G7th Performance Capo was the brainchild of a guitarist, Englishman Nick Campling, who is also a professional product designer. After 30 years of capo dissatisfaction, he fixed his eye upon the challenge of making a better mousetrap, err, capo. To do so, he looked at those produced in recent decades and how they may have fallen short in his demanding estimation. His primary concerns were the effect of the capo on a guitar’s intonation, the ease of use in terms of applying and removing it, making sure the capo did not damage the guitar’s neck or get in the way of the guitarist’s fretting hand, and finally, a capo that was attractive to the eye. The G7th Performance capo does a good job in all these respects. This is no easy order, given the long and not always pretty history of this little piece of guitar gadgetry. With its dynamic, futuristic looks and the use of progressive technology, the G7th Performance Capo is among the most revolutionary. It consists of a ridged arm that goes over the frets and then bends around one side of the guitar’s neck. which is connected to a movable arm that presses against the back of the neck. 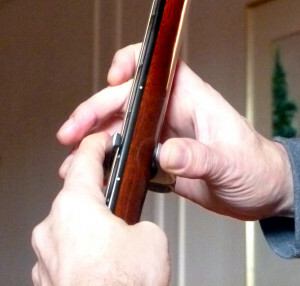 Once tightened, it will not come loose until the player flicks the small lever, or “control tang” on the hinge between the two arms. Argent silver with black underpinnings, there is a glow to the organic curves that make up most of each arm, which capture light more than reflect it. The capo looks like a miniature scale model of postmodern furniture, awaiting a diminutive occupant before setting into motion its many advanced comforts. 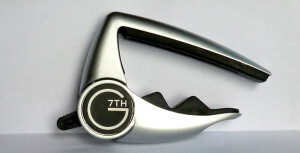 The hip G7th logo is found on the circular hub connecting its two arms, so it is tastefully out of sight from the audience when the capo is in use. In fact, the arm that depresses the strings is wider than that found on other capos, but it never looks like an unfortunately necessary contraption the way some capos can. Its gentle, silvery slopes suggest a stylish and valuable accessory. Aesthetics do not matter, however, if it did not do its job. And this it accomplishes. Where some capos fail to apply equal pressure to the strings, the Performance Capo manages to do this on a variety of fretboards and neck sizes. But it requires a little effort in some cases. The capo has no screws to twist or clips to latch. A player simply sets the fretting arm in place and then presses down on it and the arm at the back of the neck to secure the capo. When I first started using the capo, I was under the false impression that it was not at times adequately pressing on all the strings, and some would buzz when played open. It also seemed like it would only work right up against the fret, and I like having some extra room for times when I tilt my wrist forward of the capoed fret. Then, I realized I was not applying it properly. After putting the capo in place, one must give it a good squeeze to set the required pressure. The underside of the fretting arm is covered in a layer of dense rubber, the center of which is routed out, so there is a trench. In effect there is a narrow strip of the rubber at each edge of the arm, and a depression between them. The back arm of the capo is likewise covered by the same rubber, but it has two triangular protrusions pointing upward. On the outside of the back arm is a depression near the tip, which looks a lot like a fingernail at the end of a finger. Once the capo is in place, the player needs to place their thumb upon that depression, and then apply pressure on the fretting bar, squeezing the two bars until the top bar pushes the strings farther down between the frets. At the same time, the rubber protrusions at the back of the neck splay outward, gripping the couture of the neck’s profile. Once this extra pressure is brought to bear, and the rubber on both arms is well depressed, there is no string buzz regardless of where on the neck the capo is employed. It can be placed as far away as the next fret down the neck and still provide buzz-less playing. Best of all, it seems to provide less in the way of intonation issues than many other capos. At times, the two E strings do need tweaked a bit, especially on fingerboards with greater radii, but still, not as much as some other capos. The secret to the G7th Performance Capo’s versatile positioning lies in the pivotal joint between the the two bars. Inside is found a special “wrap spring clutch”, similar to those invented as a decoupling and overrun device inside photocopy machines and high speed printers, which allow smooth flowing mechanics, but only in a specific direction. As Campling put it, this type of clutch proved to be “infinitely adjustable,” and that meant it was superior to the ratchet mechanism of other capos, which limit their tightness to per-determined levels. Campling sought out manufacturers of such wrap spring clutches and contracted Reell Precision Manufacturing, of St. Paul, Minnesota to make the patented clutch found in the Performance Capo at their facility in Elsloo, Holland. The clutch has three parts – a fixed hub, a movable hub and a spring that fits tightly over both. 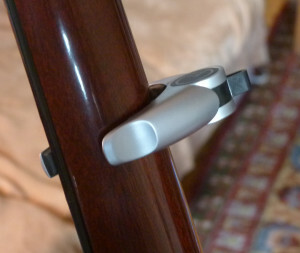 Movement that would open the arms is restricted so that a user may tighten the capo as much as desired, but it will not loosen. To open it, one flips the external control tang, which releases the tension on the spring. Since the capo can be adjusted to apply almost any amount of pressure on the strings it should work well on any guitar. Varying degrees of fretboard radius prove no obstacle, even if I did have to adjust the capo now and again to get it just right. Where some capos apply pressure by locking the clamp in place and then tightening a screw, adding further pressure from the back of the neck, the Performance Capo closes very much like an index finger making a barre chord. 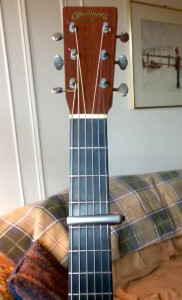 Since one uses their fingers to depress the bar, a player can bring to bear the least amount of pressure necessary so the strings sound pure, without going out of tune. I performed considerable experiments with the Performance Capo. The best results came if I remembered to apply that extra pressure to insure a successful “barre chord” across the entire fretboard. Although I found it possible to alter the intonation in an unfavorable manner, with a little practice I could eliminate this most of the time. When compared to other capos, any required micro tuning is inconsequential. In basic usage it is a non-issue. It just takes extra pressure on some guitar necks to insure all the strings are properly depressed. It did take a while to get used to how easy it is to press into place but impossible to get off until I flipped the control tang. This is a good thing of course; even the top-of-the-line Shubb capo can be popped open with the accidental jab of a thumb or finger in the wrong spot, sending the capo flying to the stage floor while releasing all the string tension at once in a violent *El-Kabong*. 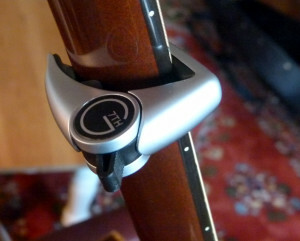 And the tang on the Performance Capo is so small it never gets in the way, unlike the extensions of many other capos. Another minor issue, the length of the fretting arm is such that it hangs off the edge of the fingerboard on the treble side. The corners at the very end of that arm are about the only edgy part of the capo and I did find it stabbing into the side of my index finger when I was playing in the first position. This was not a big deal, but it can be distracting. My solution was to put the capo on the guitar from the treble side, so that edge is hanging over the bass side and I no longer had the distracting contact. Even though this is an open-ended capo, the design will not allow a player to place it on the second fret, but leave the low E string exposed. I like to do that sometimes, effectively making a Drop D tuning (or technically a Drop E tuning.) And some capos, such as the Planet Waves NS Pro, will allow me to even leave the A string exposed as well. But most people will never employ such maneuvers, and there are special capos out there for the more adventurous player, designed specifically to leave those strings un-fretted. The main body of the G7 Performance Capo is made from die-cast zinc and the rubber housing that comes into contact with the guitar may be replaced. But the Company claims their test models have thousands of hours of use without ever needing new rubber. I have had mine for about four years now and it shows no significant wear. With all moving parts out of sight, one would have to try very hard to break this capo. It therefore gets high marks for durability, along with those for form and function. A creature of habit, I tend to travel with my Planet Waves NS capo, which is smaller and lighter in weight. My G7th Performance capo remains in my living room, accessible to me or my friends from the sofa, and where it shall continue to provide good service for many years to come.